This Mustang comes equipped with 17-inch alloy wheels, automatic xenon headlights, LED taillights with sequential turn signals, a limited-slip rear differential, keyless ignition and entry, cruise control, air-conditioning, manual front seats with driver-side height adjustment, a tilt-and-telescoping leather-wrapped steering wheel, an auto-dimming rearview mirror, a rearview camera, the Sync voice control system, Bluetooth, a 4.2-inch central display screen, MyKey parental controls (including a speed limiter, a volume limiter, geofencing and a turbocharged four-cylinder engine. 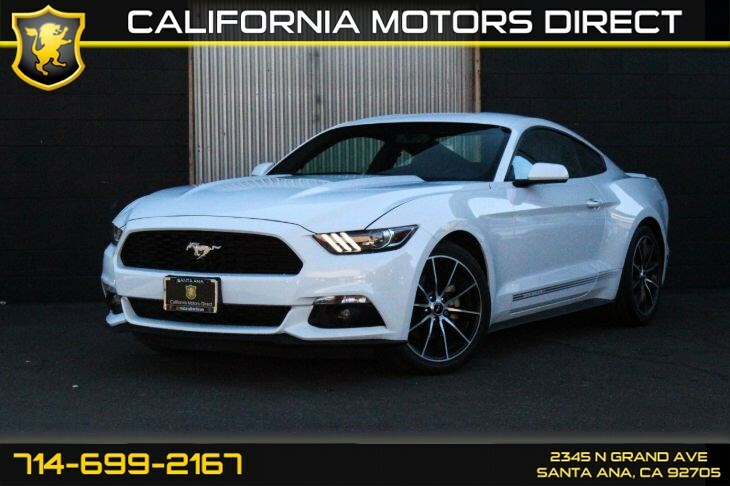 Standard safety features for this Mustang include antilock disc brakes, traction and stability control, a rearview camera, front-seat side airbags, side curtain airbags and driver and front passenger knee airbags. Also standard are Ford's MyKey parental controls and hill-start assist. This Mustang received a 5 star rating for overall crash protection. Overall this vehicle is ideal for all drivers so come on by and see it in person you won't regret it.